By: Sr. Elizabeth Linehan, RSM, Ph.D. The “coming” of Christ we celebrate in Advent is threefold: Jesus the Christ coming in the flesh, a baby born in a particular time and place; Jesus in our hearts today, coming anew; and Jesus the Christ coming in glory at the end of time. Today’s gospel reading anticipates the third coming especially. The signs, however, are not glorious so much as they are terrifying. Nations in anguish, people fainting from terror, their world shaken and in tumult. The specific events occur in the world of nature: the sea roars, heavenly bodies are shaken. And we today do see violent disturbances in our environment: raging fires, floods, especially sudden and violent hurricanes, earthquakes. For us today, though, humanly wrought terrors seem even more threatening. These reflections are being composed just a few days after the massacre of congregants at the Tree of Life Synogogue, and the mailing of explosives to a number of prominent Democrats, including a former President. I shudder to think what else may have occurred by the time you read this. We are warned: “Be careful, or your hearts will be weighed down with carousing, drunkenness and the anxieties of life.” In our time and place, an even more relevant warning might be: "Be careful, or the urge to violent retribution, racial hatred, and the lust for power that we feel in the very air we breathe will trap us." We are told to purify our nation by revoking birthright citizenship, sending Hondurans seeking asylum back to be murdered, revoking treaties that have prevented proliferation of nuclear weapons. The danger is not only outside of us, but in our very hearts. Immediately after the murders at Tree of Life, there was a call for the death penalty for Robert Bowers. Some no doubt believe that by executing their killer we show respect for his victims, and perhaps we send a lesson to others contemplating such atrocities. It is much more likely that we reinforce the lesson he already learned, that the way to show strength is to punish one’s enemies, ultimately by wiping them off the face of the earth. Thus we would continue the familiar cycle of revenge. 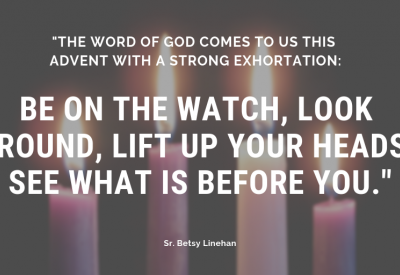 The word of God comes to us this Advent with a strong exhortation: Be on the watch, look around, lift up your heads, see what is before you. Pray that you may be able to stand before the Son of Man as lights in the darkness of our world at this moment. To download a complete set of CMN's 2018 Advent Reflections, please click here. Sr. Elizabeth Linehan, RSM, Ph.D. Sr. Betsy is an Associate Professor at St. Joseph's University in Philadelphia, specializing in criminal justice ethics, nonviolence, and restorative justice.